In 'Planet Funny,' Ken Jennings Takes Comedy Seriously In his new book Planet Funny: How Comedy Took Over Our Culture, Ken Jennings takes humor seriously, tracing how comedy infiltrated every aspect of our lives — and what it's doing to us. Buk buk. 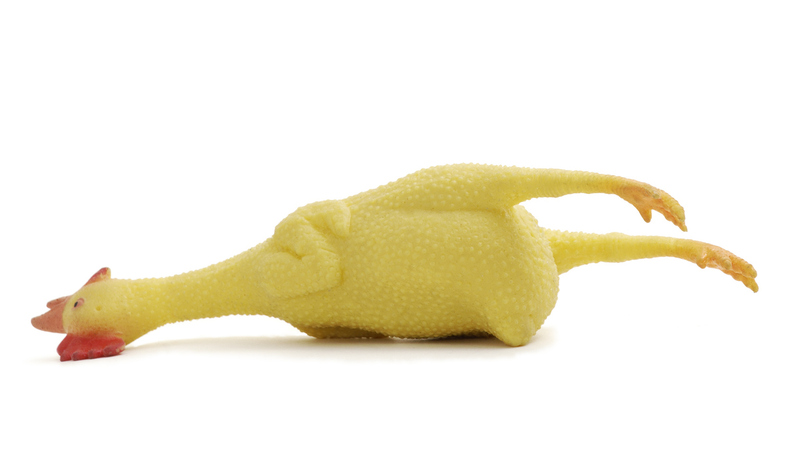 Rubber chicken keeled over on its side. He's concerned, Jennings is, about how something he loves — comedy — has transformed the way we live now. These days, he says, we collectively react to every stimulus through a lens of humor. In his view, the comedic "take" has become reflexive, unthinking and often, especially when abetted by social media, glib. His first chapter offers a representative sample of Planet Funny's chief virtues. Jennings comprehensively traces comedy's infiltration into every phase of modern life, name-checking Aristophanes, Velimir Khlebnikov and Marcel Duchamp with the same practiced ease and familiarity he does Jack Benny, George Carlin and Monty Python. He shows his work, always, and outlines how this cultural shift has manifested in art and architecture, in sports, in literature and even cuisine. Jennings addresses the question of comedy's ubiquity not as a Postman-like scold, but as a sincerely curious cultural observer with, as he notes, some skin in the game. He is, like most everyone who'd bother to pick up this book, a comedy nerd, and he brings that knowledge of, and affection for, the worlds of stand-up, sketch and improv to bear. Yes, there is a fair amount of hand-wringing in these pages, but it's clear that, in terms of the book's sensibility, the calls are coming from inside the house. He's asking a question, not issuing a screed. There's something foreboding about all the funny buildings and desserts, the fifty new Twitter jokes per minute on my phone. Don't get me wrong, I'm still laughing, but it feels unsustainable, the same way tourists often feel amid the splendid excess of someplace like Vegas or Dubai. This can't go on, right? Along the way, Jennings dissects the concept of a joke, peering under the hood to delineate how jokes work — or don't. (He does so with a welcome playfulness, it should be noted, especially as he devotes a chapter to throwing affectionate shade at the airless, bone-dry prose that marks the academic study of humor.) He wrestles with the varying comic sensibilities of different nations, spends some time (not too much, thank God) poking at the evolutionary biology of laughter, and even less (again: whew) on the (mystifying) rise and (perfectly justified) fall of corporate humor consultants. Subjects that have already launched a thousand thinkpieces — David Letterman and irony, The Daily Show as news source, political satire in the Age of Trump — get some attention here, and while Jennings wrings few fresh insights from them, he is as ever lucid, logical, thorough and clever. Readers might be forgiven for involuntarily bracing themselves prior to launching into Planet Funny's chapter on the intersection of comedy and race, given that Jennings exists in the public imagination as a handy shorthand for the very concept of whiteness itself. But as a writer he's both self-effacing and self-aware — a potent combination — so even though plenty of white middle-aged men like Jennings have eagerly weighed in on the notion of (resigned sigh) "political correctness" over the years, he does so by interrogating the assumptions he brings to the table, and asking searching questions that he knows possess no pat, sweeping, declarative answers. Which is interesting, because this is Ken Jennings, here. Trivia nerd! 74-night pain in Alex Trebek's neck! He's all about answers, delivered promptly and pithily. In Planet Funny's final chapter, Jennings does supply an answer, of sorts, for the question he poses in his first: This can't go on, right? I won't spoil his sort-of answer, but I will note that it's offered humbly, and turns out to be surprisingly modest in scope. "I come to praise comedy, not to bury it," he assures us, before proceeding to list many of the things that have made him laugh over the years. That tendency to reassure his readers is further evidence that the warning he's offering in Planet Funny offers is just that ... offered. Another writer might have issued a clarion call, but Jennings is content to squeeze, gently, a whoopie cushion.